People at the Place de la Republique in Paris pay their respects to victims of a terror attack at the offices of newspaper Charlie Hebdo. RENNES, France -- Renault and PSA/Peugeot-Citroen stopped production lines on Thursday during a nationwide minute's silence in remembrance of the victims of a terror attack on a Paris-based newspaper. French President Francois Hollande declared a national day of mourning on Thursday after the attack left 12 people dead at the Paris offices of the satirical newspaper Charlie Hebdo on Wednesday. 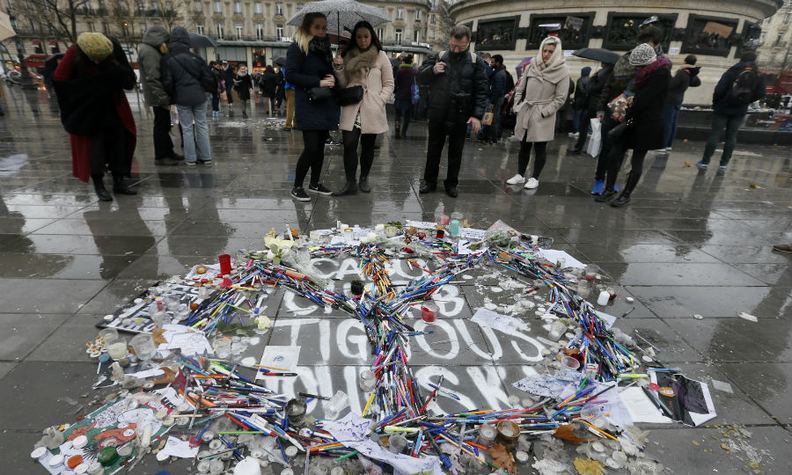 Hollande asked businesses and schools to observe a "moment of silence" at noon. Renault and PSA said they had stopped production for a minute in honor of the victims. A Renault spokesman told Automotive News Europe that employees in its French and its global operations had observed the silence.